Graham's Six Grapes Reserve Port wine is one of Graham’s original Port blends. The distinctive depiction of grapes on the label has always been used on the barrels to identify the “Six Grapes” blend. Only grapes from first-class vineyards are used for this mark. 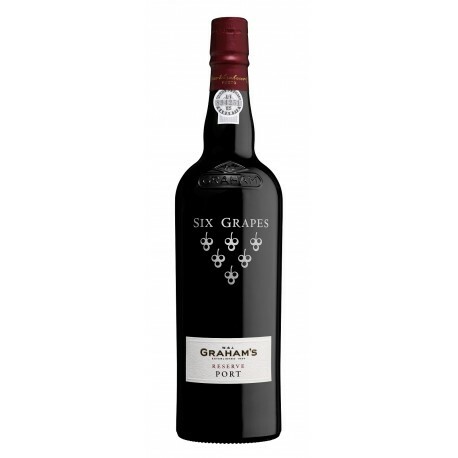 Six Grapes is a true expression of Graham’s house style with great richness and complexity. Six Grapes is a big hearted wine. It is fruity and robust and of superb quality. It is blended to be as similar as possible to a young Vintage Port. It has often been referred to as “the everyday Port for the Vintage Port drinker”. Unique in the Port trade, Graham’s selects its “proprietary blend” ahead of its more commercial styles. All other Port shippers make a lighter style “Reserve” blend out of lots that remain after they have bottled their LBV’s.